At our daughter's school, all the 2nd graders put together a "state board" project. 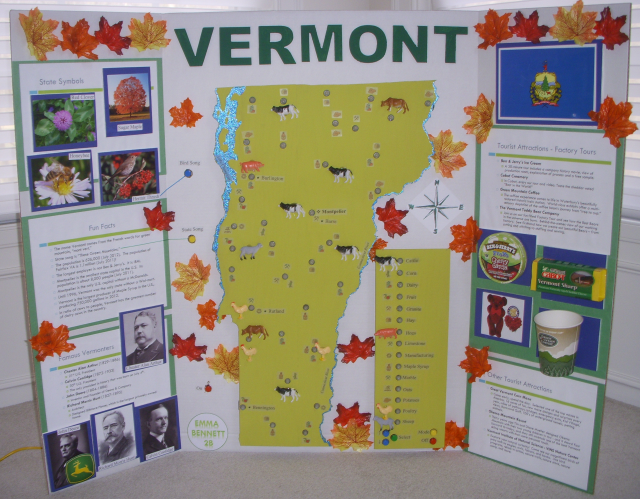 They are randomly assigned a state (in our daughter's case, Vermont) and the students work to put together a poster on a tri-fold piece of cardboard. From what I've heard, the projects often have 3D aspects like animals and products attached and several over the years have had buttons to play things like the state song. We brainstormed possible elements we might include on the board and thought about sound, light, and even considered EL-wire animated rivers. I wanted to make sure that if we chose a more elaborate design that our daughter would actually carry out most of the work and that we document that -- so I used a flip video recorder to film most of the process. In terms of electronics, our daughter jumped in fairly quickly having learned to solder at the recent Makerfaire in New York. She's built a couple of kits since then. There was a fair amount of soldering required on the Perma-Proto. The video below shows our daughter working on the Perma-Proto and button boards. We used modular 6-conductor modular phones jacks and plugs for connecting with the button panels. The legend panel used all 6 conductors for the 5 buttons and we were able to find 6-conductor modular phone cable at a local Radio Shack (this is harder to come by than 4-conductor). For the power and other buttons we just used two more 4-conductor modular cables. The cheapest jacks were in 10-packs at Home Depot but the modular cable we had was stranded so it wasn't quite so easy as just using a punch down tool -- we had to work to make sure it made contact -- sometimes tinning some of the wire where it came through the channel. 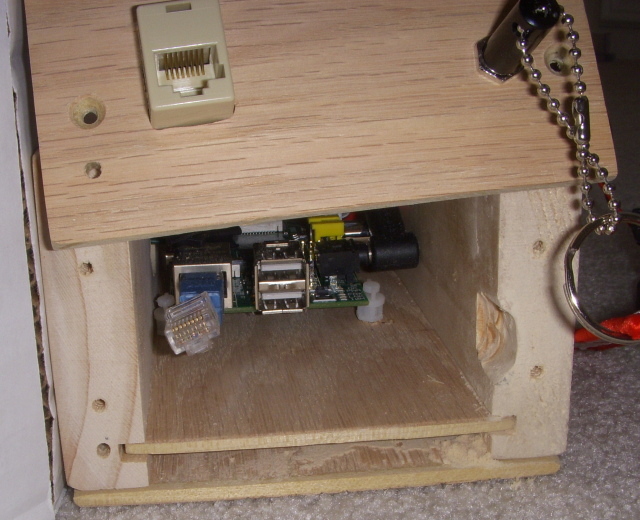 It might be easier although slightly more expensive just to use RJ45s and CAT5 for switch wiring.The finished control box, mounted on the bottom back of the center section of the tri-fold, is shown below. Now that we've covered an overview of the build and given the materials involved, let's discuss some of the major steps in detail. The Python program above will need the Python shapefile extension to be installed. It finds the record associated with the desired state, in this case Vermont, and writes out the latitude, longitude values for the state outlines to an ASCII datafile called vermont.txt that will be used by our next program. The next set of programs (written in Java and available in vermont.jar) generate g-code for various parts of the project. These all give graphical previews of the parts they will cut. 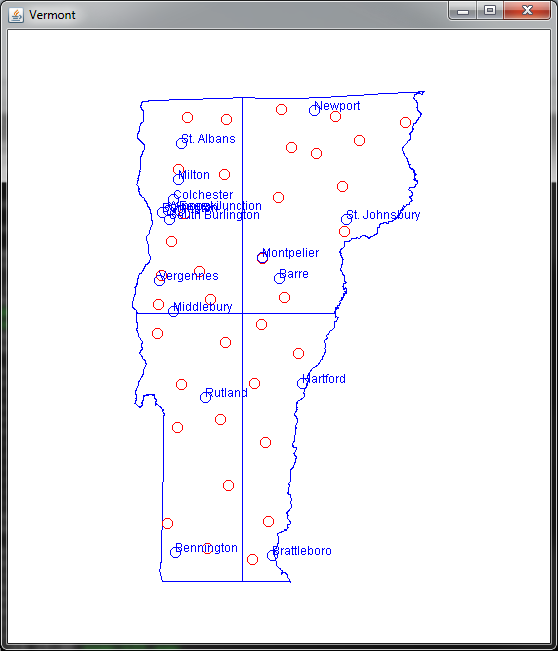 The first program (called Plot.java) plots the state boundary from the vermont.txt file but also uses resource files that have the locations of the lights (as interpolated from a Vermont product map) and some city locations (from the lat/lon) to help in understanding where to place city labels. The holes are roughly to scale which gave us an idea of whether they were too close to the edge or to boundaries of the state quarters. Some polygon intersections were used in Java to produce the 4 smaller polygons for the parts of the state we needed to cut separately. We tweaked the cut boundaries until they didn't cross any of the light hole positions but yet kept the state quarters small enough to cut on the CNC. Ultimately the program produces 4 g-code files, one for each of the state quarters (vermont1.nc, vermont2.nc, vermont3.nc, and vermont4.nc). We sized the legend panel so that it couldaccommodatethe 15 product entries with LED holes spaced sufficiently. It also had to fit in the center cardboard panel to the bottom right of the state. The primary control buttons were also located on the legend panel at the bottom. So mostly the CNC was used to drill the legend pilot holes for all the LEDs as well as for 5 buttons and to cut out the rectangular border for the panel. All the LED holes were drilled so the LEDs protrude through the holes and the flat part containing the ICs are flush against the wood on the back side. Hot-melt glue holds each LED in place. The LED chain begins at the bottom of the legend panel where the LEDs fill all the holes from bottom to top and then they jump over to the map where they traverse the 35 holes there. In a couple of cases an LED didn't reach a hole and had to be skipped (since we didn't want to cut the two 25 LED strands). I debated about actually writing some code to search for the best way to cover the holes with a minimum of skipped LEDs (a familiar algorithms problem) -- but missing 2 wasn't so bad. As a result, we need to put together a 2 LED extension (using the other JST plug from the set) and add that to the chain. The photo below shows a top view of the board where you can see the cardboard layer, mounting blocks, and map layer. There are 4 areas where buttons are needed: at the bottom of the legend panel, an "on" button at the bottom left of the state (which includes a power LED), and buttons for the song and the bird located to the left of the upper portion of the state. All of these are backed by small proto boards whose buttons and leds extend through either the wood or cardboard and which are hot-melt glued on the back. The 5 legend buttons are connected with a single 6 conductor modular phone cord. The power button/led is connected with a 4 conductor modular phone cord and then bird and song buttons jointly utilize another 4 conductor modular cord. The electronics control box is attached to the bottom of the central cardboard panel on the back. The box is 24" long (to match the central tri-fold panel). Electronics, batteries, and speakers are laid out linearly along the full 24". To make access easier, an acrylic sliding top is used which can open fully to give access to electronics and batteries. The components themselves are also mounted to aslideable1/4" plywood base which is mounted slightly above the bottom of the box. 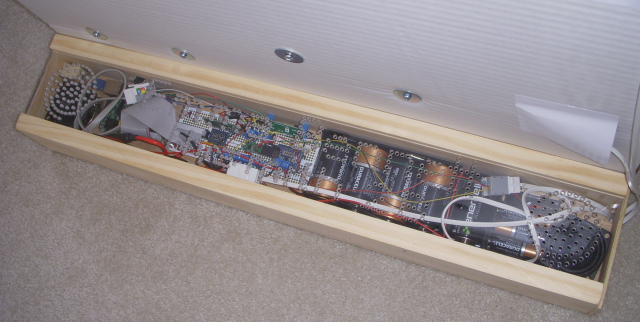 The bottom of the box can therefore be flat without the various mounting screws for the board and batteries being exposed. It's also convenient to be able to slide the electronics out. One end piece on the box has both a network jack and an external power jack. Originally, we used external power but once the battery circuit was fully in place that became much more convenient and we never used external power again during development. The power jack is wired so that battery power cuts off when external power is applied (but a jumper needs to be removed if you want to provide regulated 5 volt power through the external jack -- otherwise a slightly higher voltage needs to be supplied as the internal 5 volt regulator needs a slightly higher voltage -- as the 5 "D" cells are providing when it's on battery). A dummy plug inserted in the external power jack serves as an effective "safety" so the system isn't accidentally triggered during transport. 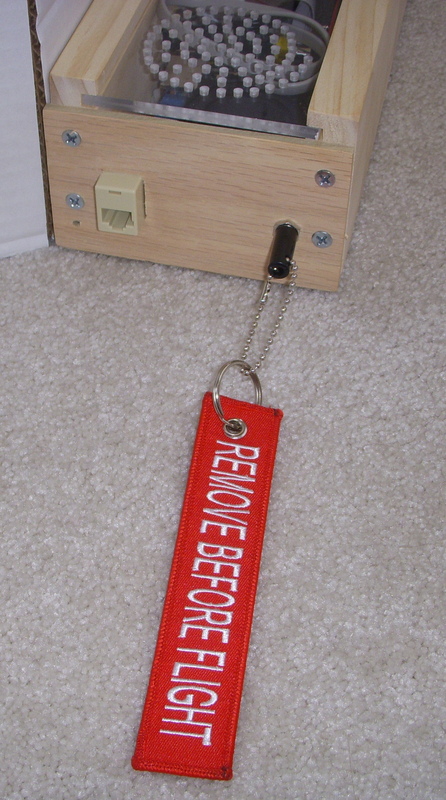 In a nod to the aviation community, it seemed reasonable to attach a "Remove Before Flight" banner to the dummy plug to clearly show its purpose (and I recently witnessed parents at our daughter's school removing the plug without needed explanation to give it a try). The photo below shows the end of the enclosure with the network/power connection end removed. This shows the bottom that the components are connected to. You can see the Pi board with the circuit board clips which hold it to the base. Sheet metal screws of the appropriate depth were used with the clips to allow a mount on the 1/4" plywood. The speaker normally occupies the space at the center of the photo. A very short RJ45 male-to-male cable was created to bridge the gap between the Pi and the female-to-female RJ45 which was used as the network connector on the end panel. One fun detail was to create some sound/ventilation holes in the acrylic slide cover to the enclosure. The AcrylicTop class included in the vermont.jar generates the g-code for the vent holes. Since these were vent hole patterns, the code doesn't actually need to access the strokes for the font characters. The code renders the characters to a small image and then iterates the pixels of the image to determine where the pixels are filled. The location of these are then scaled and translated as desired for the position and location on the cover. Basically, this kills any current instances of aplay and backgrounds a new one. A synchronous version would just omit the ampersand and would block until the audio is played. We do that in a few places to simplify the logic.The ability to background thread the audio makes it possible for us to poll buttons and cause LED changes while the audio is playing (an alternative would have been to use interrupts to service buttons). In some places we simplified the audio to be backgrounded by merging clips into a single file (often with "combo" in the name). That avoided need to background a sequence of play operations.The application has 4 modes of operation controlled by the "Mode" button: manual, automatic, quiz, and settings. In manual mode, the up and down arrows and select can be used to highlight elements on the legend and to show where those are on the map. Pressing select plays audio associated with the item. Automatic mode will automatically cycle through the legend. Select will still work but hitting up or down will jump back to manual mode. Quiz mode will quiz users on Vermont facts and they need to use the up and down and select to choose one of the legend items to answer each question. Settings mode allows the auto shutoff time to be change from 5 minutes up to 60 minutes. The default is 5 minutes to conserve power. The state song and bird song buttons can be selected in manual or automatic mode. The "Off" button shuts the project down (giving you a couple chances to bail out before the real shutdown starts). The "On" button is used to power up (but it actually will perform an emergency shutdown if pressed again -- an artifact of the way the Pololu switch module works).The application is highly data driven with a "highlights" list giving the sounds, colors, and associated lights to play together. A "quiz" list gives a list of quiz questions and answers.Structuring the Python so that most customizations can be performed through editing the data makes it more accessible to kids who can create the details themselves (our 2nd grader did, see the video below as she uses the Adafruit WebIDE to enter her custom data). Keeping the rest of the code modular (we could have probably done better) makes it easier for kids to contribute some of the logic (say for the quiz section) without needing to think about all the more complex interactions. Let's take a look at the layout of components in the enclosure first. On the left is the mounting position for the Pi which directly connects with the network jack on the outside -- which is handy for adjusting the program with the WebIDE. The right speaker also fits there (it'll be the right as you face the front of the board). The external power jack is tucked under the speaker opposite the network jack. You can also see the hole that carries the LED cable and the 6-conductor button cord to just under the legend panel. In the center is the Perma-Proto board which comprised most of the soldering work. We'll look at it's layout below. You can see on the left is the ribbon cable connected to the Pi. On the right side we have the two battery packs. The 5 "D" cells power the Pi and the LED strand. The 3 "AA" cells power the audio amplifier (so as to be isolated from the main supply). On the far right is the left speaker. Altogether it's a pretty tight fit but it nicely keeps the poster stable -- as a counter-weight to the wood and LEDs on the front -- and keeps the center of gravity low. 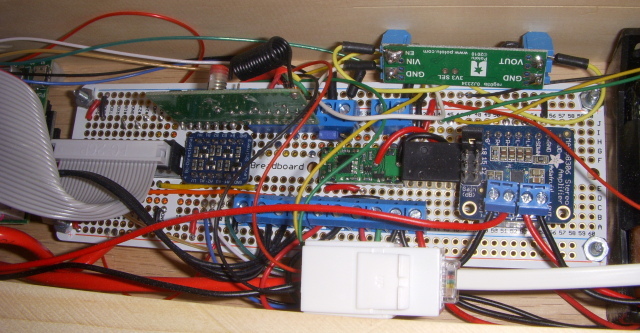 The photo below shows an enlarged view of the Perma-Proto board. Just to the right of the ribbon connector is the level converter. The RF receiver board which sits vertically right above it operates at 5 volts and the level shifter converts the 4 digital outputs of the RF receiver board to the 3.3 volt level for the Pi. The pinouts match pretty well so a 7 pin socket can share the same pins with the level converter (see the second photo of the Perma-Proto with RF receiver, amplifier, and voltage regulator removed).In the center of the board is the Pololu switch module which lets a momentary switch power up the system. It operates directly off the voltage provided by either the external power or the 5 "D" cells. A 5 volt regulator is optionally patched in through a jumper and PCB terminals (green board at the top). The only case you wouldn't use it is if you had a regulated external 5 volt supply. Mainly because it was handy a 5 volt relay (to the right of the power module) is used to trip power on to the audio amplifier through it's separate supply when the main power comes up. 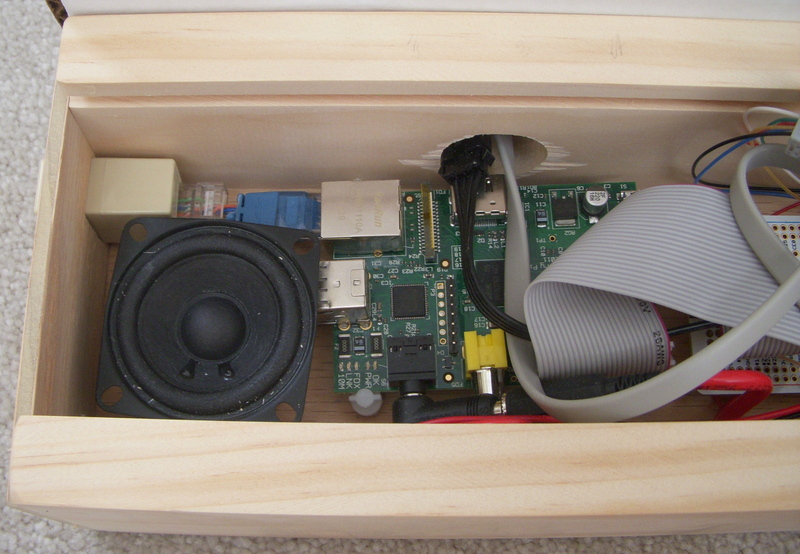 This is basically providing isolation so the audio amplifier's potential power spikes don't bring down the Pi. 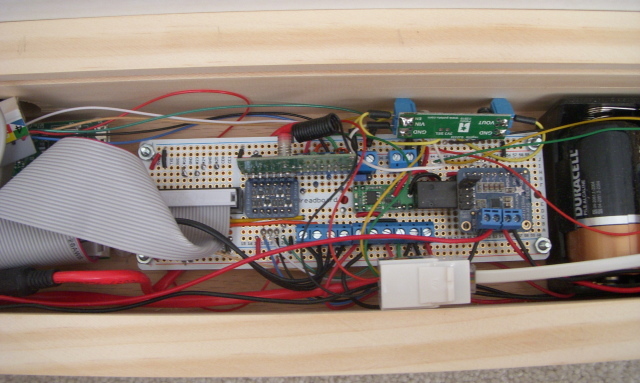 The amplifier itself fits into a socket to the right of the relay at the far right side of the board. Socketing the amplifier makes it easy to remove the speakers and amp as a unit. The amplifier also includes a jumper to control gain. In the photo, the RF antenna is coiled up. Reception was improved by stretching out the antenna to the full length of the box -- but range was still fairly weak. I'm not sure we'd include the RF receiver if we were to do this again. It would be useful to design a board for the Pi with this combination of features (power, LED strands, amplifier, and possibly RF). Since the project is already on exhibit at the school, I don't have it handy as I'm writing this. 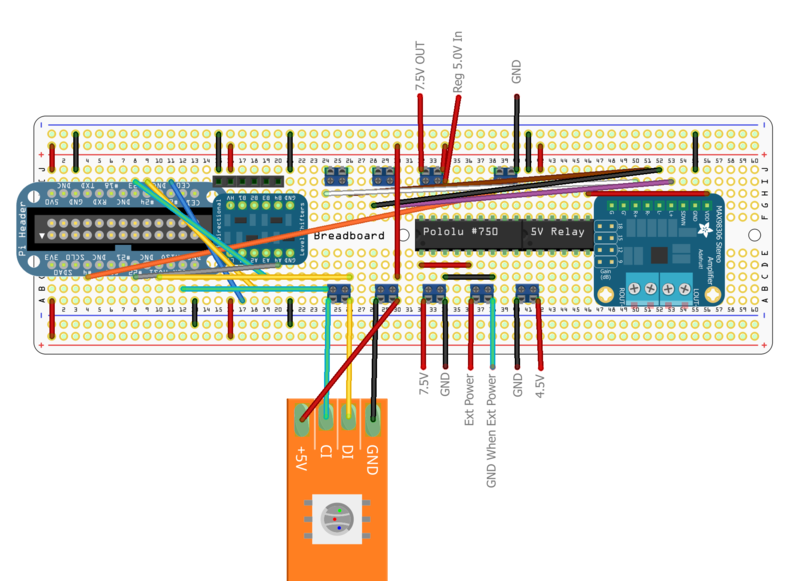 I put together a high-level Fritzing breadboard diagram below to clarify some of the layout. I substituted a Pi Cobbler for what is really a unified Pi Perma-Proto board (but isn't in the Fritzing library yet). It doesn't include all of the modular switch wiring for the buttons. The two PCB screw terminals on the upper left are for the audio channels from the Pi. The other two on top are for the external 5 volt regulator. The two on the bottom left are for the LED ribbon (although the one we used has the 5V next to the GND line hence our screw terminal layout). The next terminal is where the 5 "D" cell pack connects. The next 3 wires are where the external power connects -- when nothing is plugged in, the green wire is connected to ground and enables the 7.5 volt battery. The last two wires are where the amplifier power connects. The diagram also doesn't show the Pololu #750 switch wires which come from the middle of the module (where a switch might normally be mounted). The SPDT relay pinout is such that when the main 5 volt power comes up the relay trips and the 4.5V supply is connected to the amplifier power. The amplifier is elevated from the board on a couple of female headers so it can be easily removed. The RF receiver module docks in the terminal strip shown above the level converter. The last pin of the module is not used and is bent away so as not to contact the board. Well that concludes one of my longest writeups. I hope I've provided enough detail for those who might want to tackle something similar. Working with our daughter on a complex project like this was a pretty amazing experience -- I still marvel at the variety of work she did in looking back on the videos we took -- but it really is possible if the work is spread over a number of weeks.